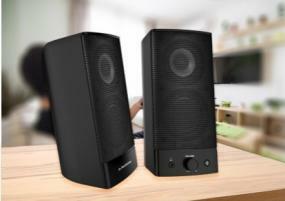 At 10W these are some of the best rated speakers for desktop and laptop computing on the market. With support for both wired and bluetooth devices you won't be disappointed. AC adapter included: Powered by the AC adapter - no need to charge. Without a built-in battery, this speaker lasts much longer than many battery-powered Bluetooth speakers in the market. Due to the weight and cost of shipping this item it is only available to customers purchasing a computer or are within the United States. Note: Bluetooth adapter not included. All recently released distributions are supported out of the box. Add bluetooth capability to your computer with a Penguin Bluetooth USB Micro Adapter. A Bluetooth USB adapter enables you to connect Mice, Phones, Keyboards, Speakers, and other devices wirelessly to your computer.